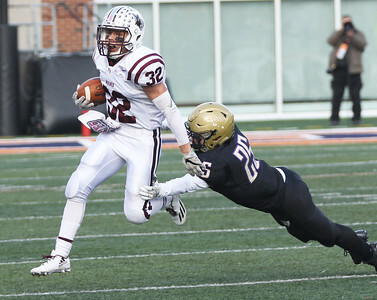 H. Rick Bamman - hbamman@shawmedia.com Prairie Ridge's Sampson Evans runs for an 80 yard touchdown in the first quarter against Sacred Heart-Griffin in the Class 6A State Football final Saturday, Nov. 26, 2016. 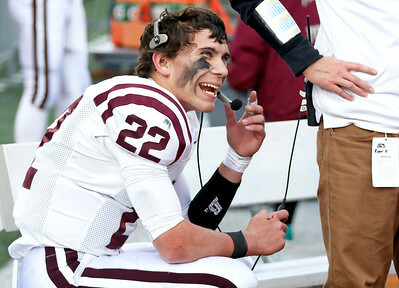 H. Rick Bamman - hbamman@shawmedia.com Prairie Ridge quarterback Samson Evans talks with coaches after his 80 yard touch down run in the firstquarter against Sacred Heart-Griffin in the Class 6A State Football final Saturday, Nov. 26, 2016. 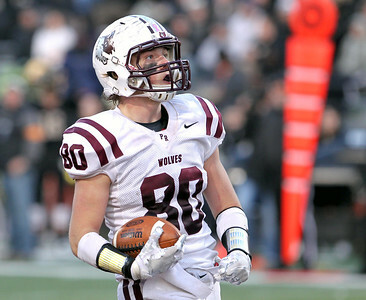 H. Rick Bamman - hbamman@shawmedia.com Prairie Ridge's Cooper Tomlin reacts to a first quarter touchdown against Sacred Heart-Griffin in the Class 6A State Football final Saturday, Nov. 26, 2016. H. Rick Bamman - hbamman@shawmedia.com Prairie Ridge's Sampson Evans runs down the sideline for a first down in the second quarter aginst Sacred Heart-Griffin in the Class 6A State Football final Saturday, Nov. 26, 2016. 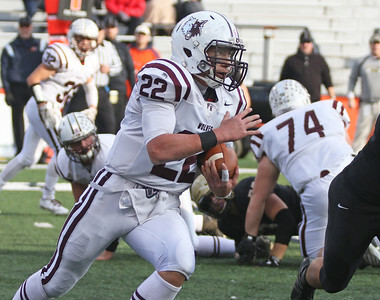 H. Rick Bamman - hbamman@shawmedia.com Prairie Ridge's Austen Ferbet scores on a 28 yard Sampson Evans pass in the fourth quarter against Sacred Heart-Griffin in the Class 6A State Football final Saturday, Nov. 26, 2016. 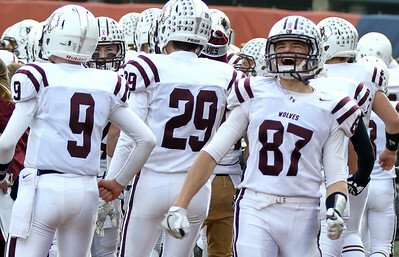 Prairie Ridge won, 48-17. 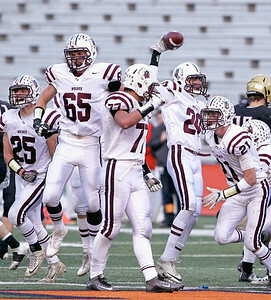 H. Rick Bamman - hbamman@shawmedia.com Prairie Ridge's Jacob Ommen (from left) Peter Dunican, Jeffrey Jenkins, Pete Berg and Justin Mikolajczewski celebrate Berg's fuble recovery against Sacred Heart-Griffin in the Class 6A State Football final Saturday, Nov. 26, 2016. H. Rick Bamman - hbamman@shawmedia.com Prairie Ridge's Austen Ferbet (left) and kicker Derek Greiner reacts to his second quarter field goal against Sacred Heart-Griffin in the Class 6A State Football final Saturday, Nov. 26, 2016. 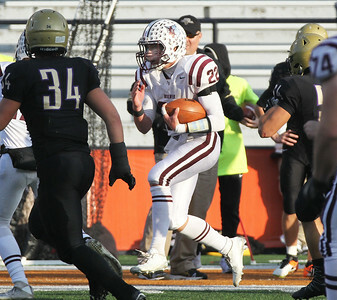 H. Rick Bamman - hbamman@shawmedia.com Prairie Ridge's Zach Gulbransen runs through Sacred Heart-Griffin defenders including Matt Brenneisen (34) in the third quarter during the Class 6A State Football final Saturday, Nov. 26, 2016. 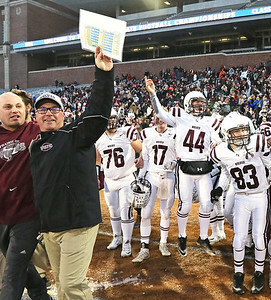 Prairie Ridge won the state title 48-17. H. Rick Bamman - hbamman@shawmedia.com Prairie Ridge's Zach Gulbransen runs past Sacred Heart-Griffin's Joey Milbrandt for a first down in the first half in the Class 6A State Football final Saturday, Nov. 26, 2016. 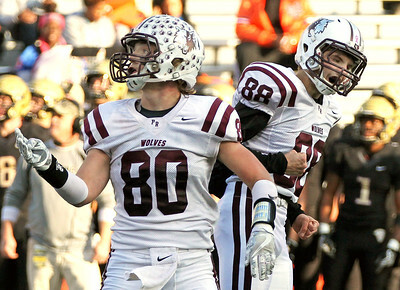 H. Rick Bamman - hbamman@shawmedia.com Prairie Ridge's Pete Berg (left) and Grant Golata celebrate the Wolves 48-17 win over Sacred Heart-Griffin in the Class 6A State Football final Saturday, Nov. 26, 2016. 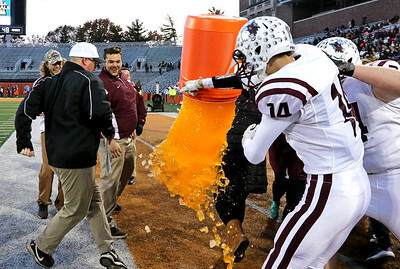 H. Rick Bamman - hbamman@shawmedia.com Prairie Ridge players including Matthew Grant (14) try to soak head coach Chris Schremp at the end of the fourth quarter against Sacred Heart-Griffin in the Class 6A State Football final Saturday, Nov. 26, 2016. 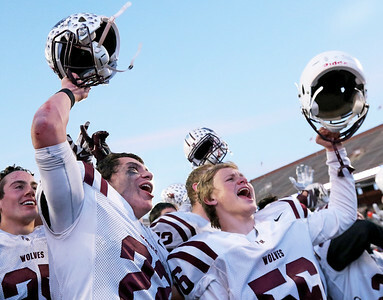 H. Rick Bamman - hbamman@shawmedia.com Prairie Ridge coach Chris Schremp and players celebrate their 47-17 win over Sacred Heart-Griffin in the Class 6A State Football final Saturday, Nov. 26, 2016. 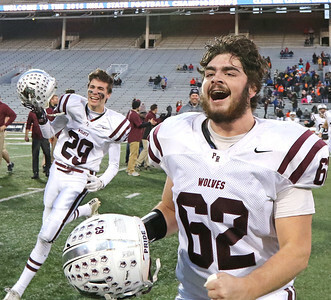 H. Rick Bamman - hbamman@shawmedia.com Prairie Ridge players including Sampson Evans (left) and Scott Nygren celebrate the Wolves 48-17 win against Sacred Heart-Griffin in the Class 6A State Football final Saturday, Nov. 26, 2016. 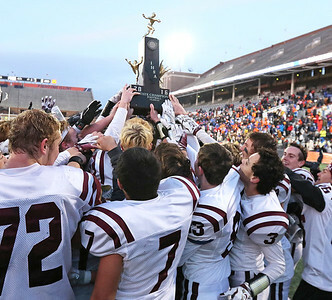 H. Rick Bamman - hbamman@shawmedia.com Prairie Ridge players hoist the Class 6A State Football first place trophy after defeating Sacred Heart-Griffin 48-17 Saturday, Nov. 26, 2016. Prairie Ridge's Jacob Ommen (from left) Peter Dunican, Jeffrey Jenkins, Pete Berg and Justin Mikolajczewski celebrate Berg's fuble recovery against Sacred Heart-Griffin in the Class 6A State Football final Saturday, Nov. 26, 2016.